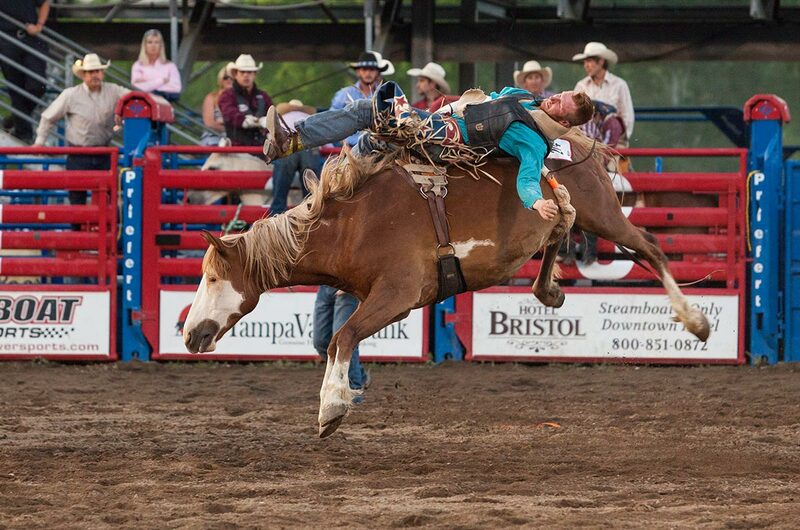 The Steamboat Springs Pro Rodeo Series is the most successful weekly rodeo in the country. While the roots of rodeo in this modest little Northwestern Colorado ranch town/world class ski resort trace back over 100 years, the humble beginnings of the weekly rodeo were in the mid 1970's as the "Friday Night Jackpot." Contestants gathered once a week to compete for their accumulated entry fees. Within a few of years, the Jackpot Rodeo grew to include Saturday night as well as Friday and the Steamboat Springs Rodeo Series name was coined. In 1988, the first and last weekends of the 10-week series were sanctioned by the Professional Rodeo Cowboys Association and were known as Ski Town Stampede I & II. With the success of its first two forays into ProRodeo, the committee decided it was time to go "all pro." In 1989, the name was changed to Steamboat Springs Pro Rodeo Series and has been fully sanctioned by the PRCA ever since. Years and years of effort and improvement were recognized by the rodeo industry in 2002. 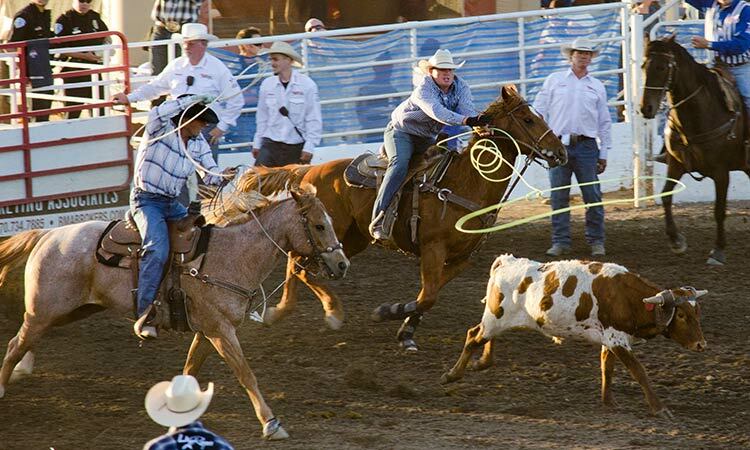 By a vote of contestants, stock contractors, contract personnel and other rodeo committees, the Steamboat Springs Pro Rodeo Series was selected from approximately 500 PRCA rodeos that are neither indoor rodeos nor large (based on their added money) outdoor rodeos as 2002 Small Outdoor Rodeo of the Year. The Board of Directors recognizes that this ultimate honor in rodeo was not for a particular weekend, or even a particular year, but truly amounts to a Lifetime Achievement Award. Every Friday & Saturday Night beginning June 21 and ending August 12. There are special performances on Wednesday and Thursday, July 3rd and 4th that start at 7:30 PM. Discount Rodeo tickets are available through Mountain Resorts. Purchase at our front desk when you check-in, or call our reservations department at 888-686-8075. There is a traditional BBQ serving ribs, chicken, beef, burgers, dogs and brats beginning each rodeo evening at 6:00 p.m. and runs until 9:30 p.m. There is also a full service bar offering cold beers and wine. Pre-Rodeo entertainment appears on the entertainment stage at 6:00 p.m.
All performances are held at Romick Arena located in the Howelsen Hill Park Complex owned by the City of Steamboat Springs. The arena address is 501 Howelsen Parkway, Steamboat Springs, Colorado 80487. More information. The gates open at 5:30 p.m. If you want to enjoy the delicious barbeque, you should plan on allowing yourself enough time to eat before you sit down for the rodeo, which starts at 7:30 p.m.
Where is the best seat? All seats offer an excellent view of the arena. However, since all seats are general admission, if you want to sit in a particular area, like the grandstands, try to be there by 6:30 p.m.
Where are the rodeo grounds located? The Brent Romic Rodeo Arena is located just a couple of blocks from downtown at 5th Street and Howelsen Parkway in the Howelsen Hill sports complex. There is parking on the rodeo grounds and nearby. If you want to avoid the crowd after the rodeo ends, you can park downtown and walk to the rodeo arena. An on-site barbecue with beef, chicken, ribs and sides heats up at 6:00 p.m. complete with thirst-quenching beverages for the entire family. Bars serve beer for those 21 and over. The temperature cools down after the sun goes down, especially during the early part of the summer season. We recommend that you bring a jacket or a blanket to keep warm. The rodeo goes on even if it rains. As the arena gets muddier, the action can become even more entertaining to watch. The arena’s grandstand seating area is covered in case of inclement weather. Approximately two hours. Occasionally it may go a little longer. No, dogs are not allowed at the rodeo. It is dangerous for your pet, as well as the rodeo animals. Can I pet the animals? Please do not go near the rodeo animals, especially the bulls. These animals are not pets and can be temperamental. What is there for children to enjoy? From rodeo clowns to roping games, there’s plenty to keep the kids occupied while anticipation builds for the show to start. There’s even a chance to get in on the action in the arena with the Calf and Ram Scramble events, where children chase around a calf or a sheep to earn the ribbon on its tail as well as fun prizes.